Porto Amigo is a program that carries out reconstruction, repair, and improvements to the homes of people in a vulnerable economic situation to enhance mobility and health. These construction works are carried out by both national and international university students, that are volunteers in the Just a Change Association (partner of the project) and, if possible, with the involvement of the beneficiary. 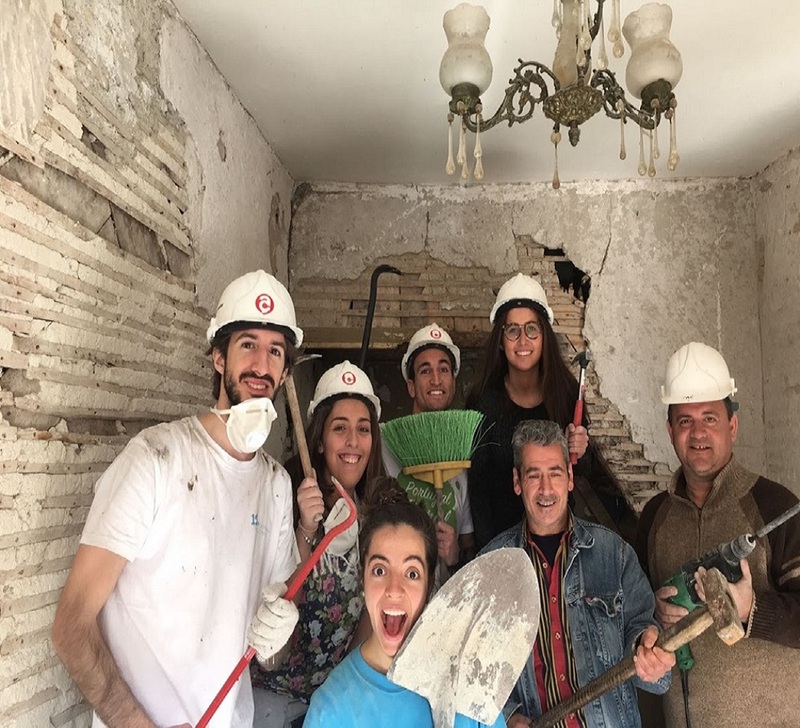 The main objective of the Porto Amigo program is responding to the most urgent needs in housing, namely in the rehabilitation of degraded buildings belonging to low-income households, in order to optimize social intervention at the municipal level. The Porto City Hall developed the program Porto Amigo, with the main objective of promoting positive, active and healthy aging, as well as avoid and overcome the isolation and / or social marginalization of the senior population of the municipality. This program targets people living in the municipality of Porto, in non-municipal housing, in a situation of proven economic shortage, who are over 60 years of age or who include in their household a family member with a disability equal to or greater than 60%, certified by health authorities. In addition to improving the liveability of beneficiaries’ homes, Porto Amigo also allows them to remain in their social environment, reinforcing their sense of belonging in the place where they live, fighting their feelings of isolation and loneliness, as along and after the physic intervention the volunteers keep the contact with the beneficiary and promote their inclusion in community activities. The partners involved in Porto Amigo Program are: Porto City Hall; Manuel António da Mota Foundation; G.A.S. Porto — Social Action Group of Porto; Just a Change Association. Other target group(s): Homeless; people with disabilities greater than 60%. How collaboration worked: Porto City Hall: Responsible for the implementation, monitoring and evaluation of the Program; Manuel António da Mota Foundation: Responsible for providing funding for the project; G.A.S. Porto — Social Action Group of Porto: Responsible for the improvement of well-being, promoting opportunities for integrated and sustainable socio-economic growth and helping to respond to primary needs. Just a Change Association: Responsible for the technical evaluation and budgeting, for the preparation of the projects and for the implementation of the rehabilitation intervention and for the recruitment and management of the volunteers. Details on older people's involvement: Older people participate in making improvements to their homes if possible, and benefit from improvements made to their homes. The Porto Amigo program meets one of the objectives of sustainable development advocated by the United Nations - reduce inequalities - offering dignity to the housing, as a way to bridge the perceived and experienced inequalities among the population of the city, especially the seniors. Since 2009, 26 houses have been repaired. The Porto Amigo program guarantees sustainable development by meeting the needs of its beneficiaries ensuring that in the future they are able to meet their own needs. For this purpose, regular monitoring of the beneficiaries is carried out through home visits, asked questions to determine well-being before and after the intervention is complete, telephone contacts and articulation with the different partners, contributing to a good maintenance of the intervention. The older beneficiaries demonstrate great satisfaction with the outcome of the interventions made, reporting an improvement in their quality of life, promoting active and healthy aging. The Porto Amigo Program is intended to embrace the largest number of participants, circumscribed to the municipality of Porto. - Promote a greater dissemination of the Porto Amigo Program to the population that could be embraced by this Project; - Greater awareness among the general population to promote active aging policies; - Follow up of the intervened houses. The main constraint of the program is that houses are often rented, and their owners are reluctant to authorize improvement works, since one of the requirements of the program is that the landlord does not increase the value of the rent and not issue a discharge order after the execution of the work.